Who – You are alone Or a couple Or a group of friends Or even a small family. This destination is for all of us who want a short n crisp break from our office and weekend partying. 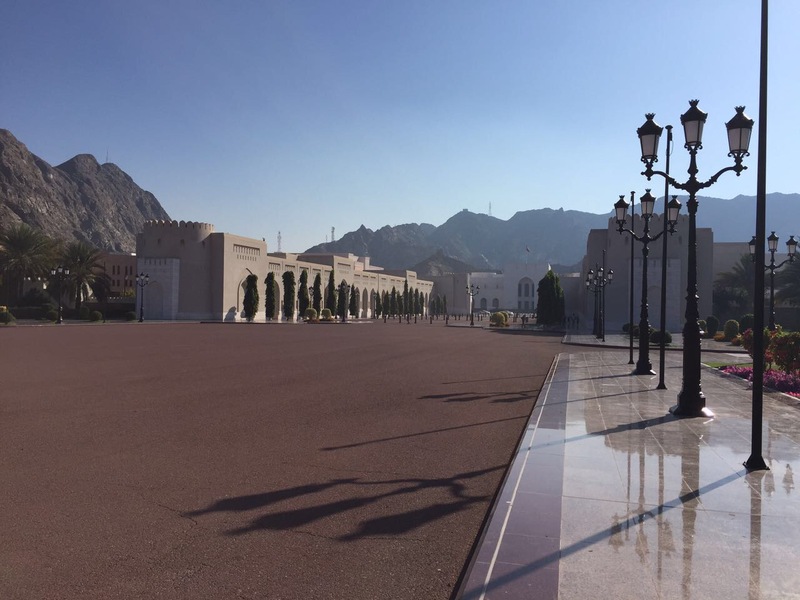 Why – Oman is not a busy world where we all belong to. Not everyone is entitled to extended leaves neither everyone has the budget for a weeklong vacation. Oman fits your pocket well with no hassles of leave approvals. When – It a perfect fit for any winter weekend. The best time to plan your trip is on a long weekend. Two night and three days are ideal for Oman, especially if you just want a small stop to your bumpy life. Where – Muscat is almost 400 km away from Dubai easily accessible if you have your own car. Although the journey is for good 6-7 hours but it’s an amazing drive. But if you are habitual of paying fines, then you can cover the distance in less than 5 hours. Less traffic – a calm and cozy city with beautiful roads running between mountains. The spiral road in the city is breathtaking especially early morning. Al Qurum – it’s one of most beautiful experience of my life. The cyclical spiral road drive and the view from the roadside are mesmerizing. 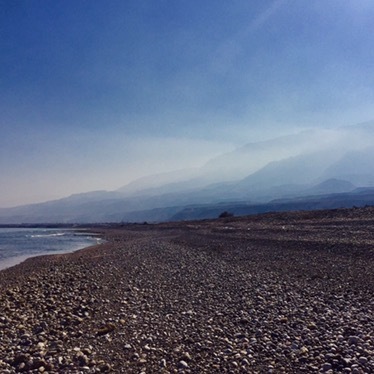 Al Qurum Beach – the most beautiful part of Oman is this beach. Sand is not dry and the waves are not too high. Just so apt for you to stand close to the shore and let the wet sand make you feel cold. 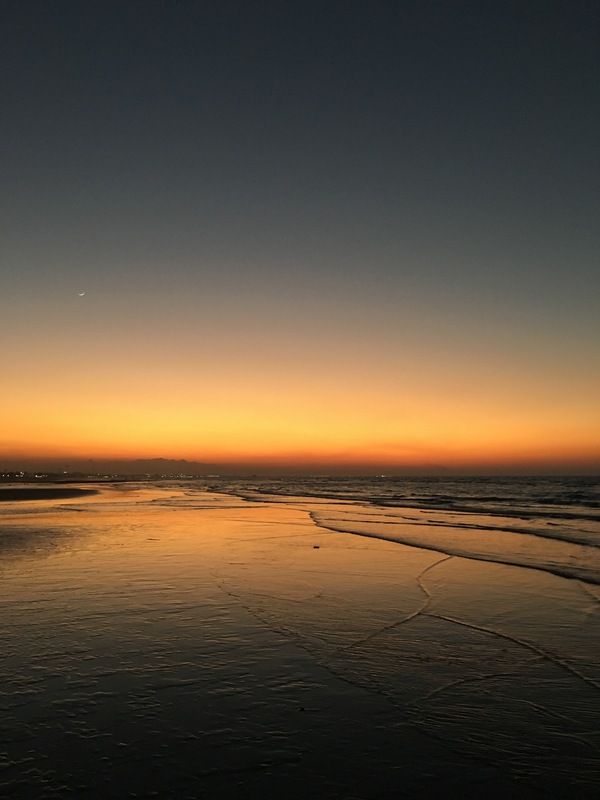 It’s a quite beach with hardly any commercial activities, you can experience the peace of your life in the sunset when the sky blows away all the rainbow color. The dark brown sand stays still and doesn’t wash away, it just stays along with you and helps your soul take a quick dive in the ocean.Just enjoy the harmony between sea water touching your feet and singing with the vibrant colors of the sky. Crown Plaza Hotel – Rather slightly expensive, it’s definitely not for budget travelers. However, the location of the hotel has many advantages over its tariff. The view of the ocean, the subtle noise of the waters at the shore and the glittering light on the rim on the city defines the soul of this place. Soak all you can from its beautiful sea view restaurants, in day or night, sunrise or sunset.You can also plan a dinner or breakfast to experience the wow, and stay close by to al quorum. Al Alam Palace – I was too tired to go inside in this one. The place is anyways mostly locked up and you can only walk in the open aisles. However, what you should not miss is the spectacular view of this palace, the sea, the mountains, and the army headquarters from Al Alam street. You get to have the freedom to park your car, sit on the boundaries of the rocky shorelines and let the cool breath touch your skin. Carry coffee, tea whatever you like with a book or music or just nothing. You can just sit there and let your body be a sponge to observe the sight. Drive to Sur- There is nothing much to this small village other than its beach, which rather gives you a feeling of an Indian ghat. However, it’s a classic case of the journey being more beautiful than the destination itself as the drive to Sur is the only reason due to which it makes it to my list.The drive is unexpectedly nice and definitely an experience difficult to be captured in words. You will get to ride between the huge uncut mountains on one side and sea on the other. The sun rays touching the mountain and the sea touching the shore will make your heart pump more fresh air. The color of the sight will quickly run from the shade of brown to blue. The mirage will make you as happy as your parents just hugged you and squeezed you to death. It’s the journey where you feel belonged. If you have a car then this destination is a must go! Secluded beach just ahead of sinkhole (on the way to Sur): You would love the pictures of the sinkhole on google, but it falls short of expectations. I was a bit disappointed, as I had imagined the place something else like myself – ufff so silly of me. But it’s crowded and young boys are diving from the top into the water. We reached there in the afternoon, which could also have a bit of role to play in our experience. But what I really loved was the secluded pebble beach just before it. Its rather not a beach, but a running stretch. A small detour and offroad can take you there. The best part about this abandoned place is that it just belongs to you. Pull over for some time and enjoy the endless blue and birds. The climate is moderate even in afternoon because of sea breeze. 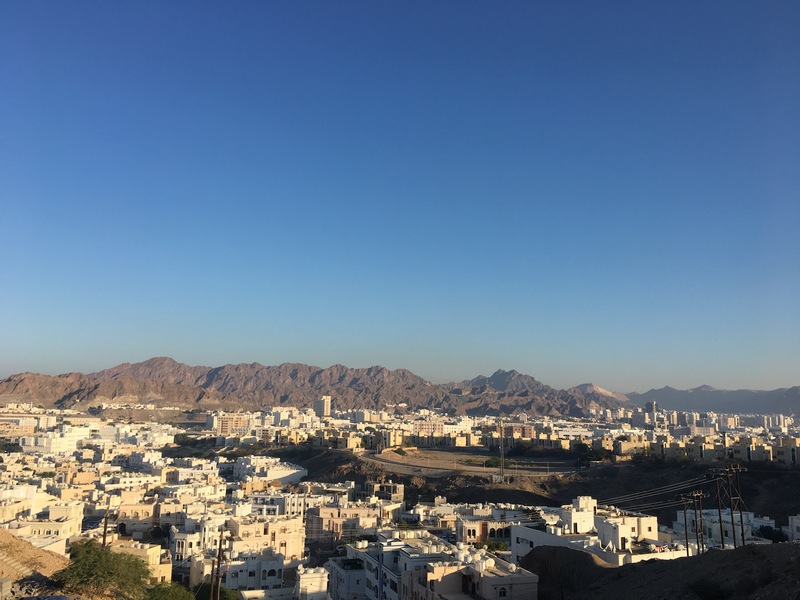 Muttrah – it’s a corniche with a beautiful view of huge yachts and ships and birds flying, with road side restaurants running parallel to the road. It’s a commerce spot and is the largest port in Muscat. Even with all the commercial activity, it’s a beautiful location for an early morning chai or an evening coffee. 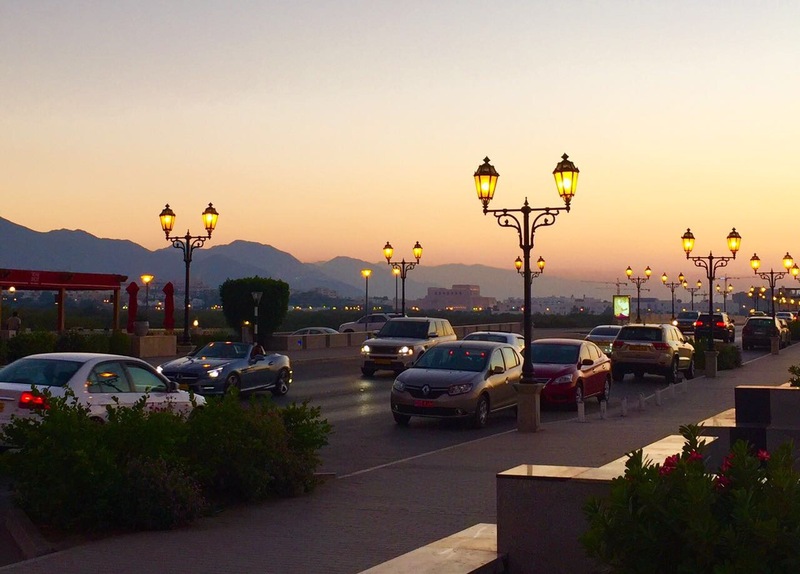 There are a lot of spots designed for public to sit and enjoy the beauty of this corniche. The Cave – hill cut place with a bunch of restaurants offering a mindblowing view of small white houses in the day and lighted homes at nights.The underground cave ambience is very close to Cappadocia. If you want to eat Indian food then eat at their Indian restaurant – Maya. It’s a must go food junction with a variety of delicious food from Lebanese to Italian. Now just a general information just in case I am successful in hard selling Oman to you. Try to start your journey early say between 4-5am. 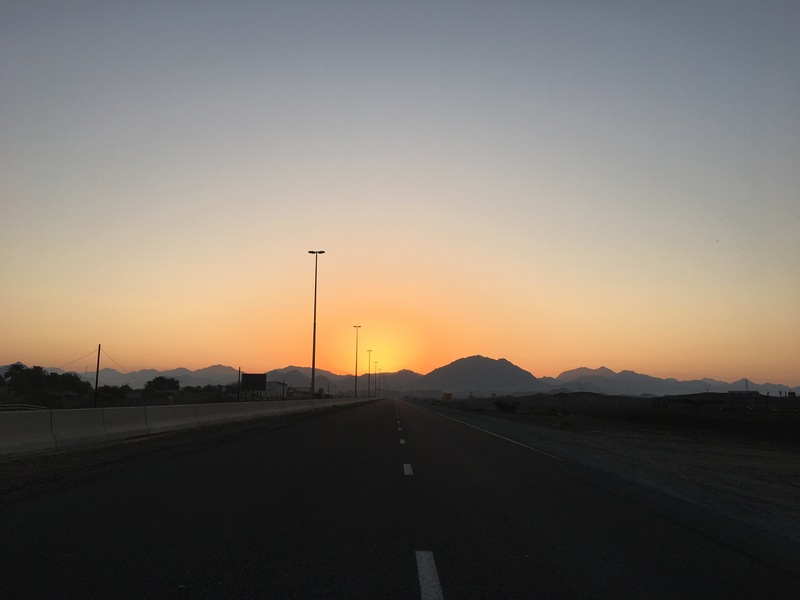 You will see the sunrise on your way to Oman which is eye cooling. You will not have to stand the queue for visa stamping. Visa stamping fee is just 50 dirham for Dubai resident and they will check your car insurance and registration. Book your stay in the budget hotel as you would be out most of the time. Check Groupon and other deals available, YouTube your hotel before finalizing. Food is not very expensive, it is almost similar to Dubai, alcohol lover says beer is cheaper to Dubai. Dress appropriately, we all deep inside know what is appropriate- short dress, deep neck, sleeveless is not a complete no but definitely not a yes too. Try to be respectful. This is true for both men and women. Even men can’t wear shorts at some places. For the mosque, no skin visibility rule applies – full sleeves and full length lower. Women need to cover their head too. For my personal fun images follow me on – www.instagram.com/lovethatyoucanbuy and feel free to write or asking anythings. Hoping to be helpful. Oman is definitely on top of my list in West Asia for its natural beauty. You have written a great post. Do you suggest driving considering there won’t be anything exciting on this route? You have captured some wonderful pictures. It sounds like a great place. Wow those were some spectacular captures. Travel posts always intrigue me being a travel buff myself. 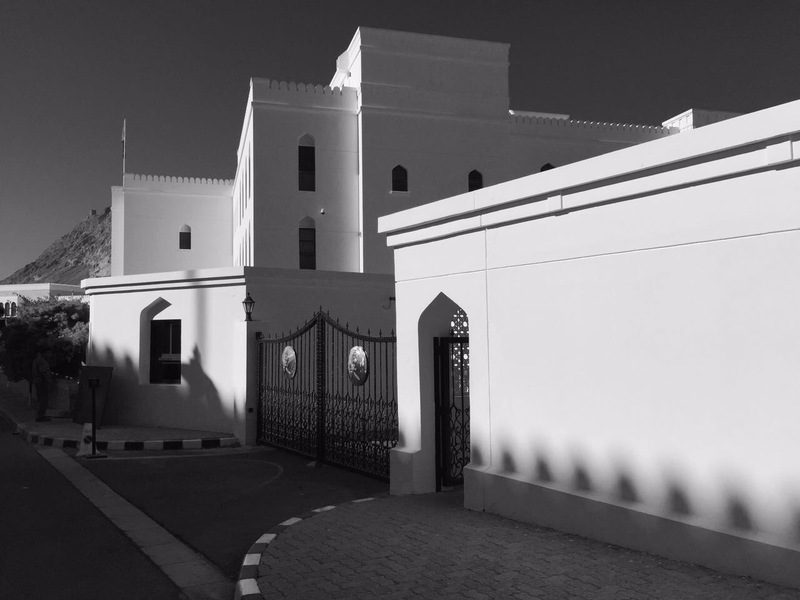 The phographs of Roadside view at Al Qurum, tinted view of the beach and monochrome shot of Al Alam Palace were my absolute favorites! 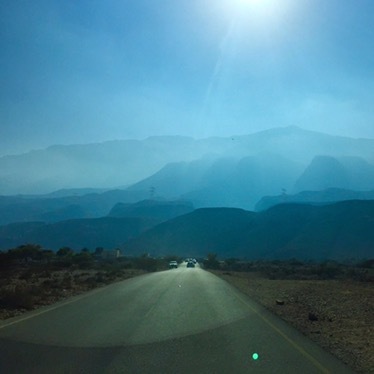 Oman is indeed beautiful and is for sure going into my list of places to travel! When it’s a photoblog, one travels with the eyes and the mind. 🙂 Some beautiful clicks, and travel suggestions. Hope one day, I can go there 😀 Till then, thanks for the virtual trip!